APC National Chairman, Adams Oshiomhole & President Buhari. It was gathered that President Buhari, who has taken charge of efforts to resolve the party’s post primary crisis, would be convening the meeting. A storm is raging in the the All Progressives Congress and if care is not taken, it might consume the National Chairman of the party, Adams Oshiomhole. Barring any last minute changes, a leadership meeting of the party will hold next week to determine the fate of the embattled chairman. A prominent member of the party, who spoke on condition of anonymity, told Punch in Abuja, on Friday that as a precursor to this meeting, the party’s National Leader, Ahmed Tinubu, and Oshiomhole, met in Paris, France, on Thursday. Tinubu had gone to France ahead of the President’s visit to the country. 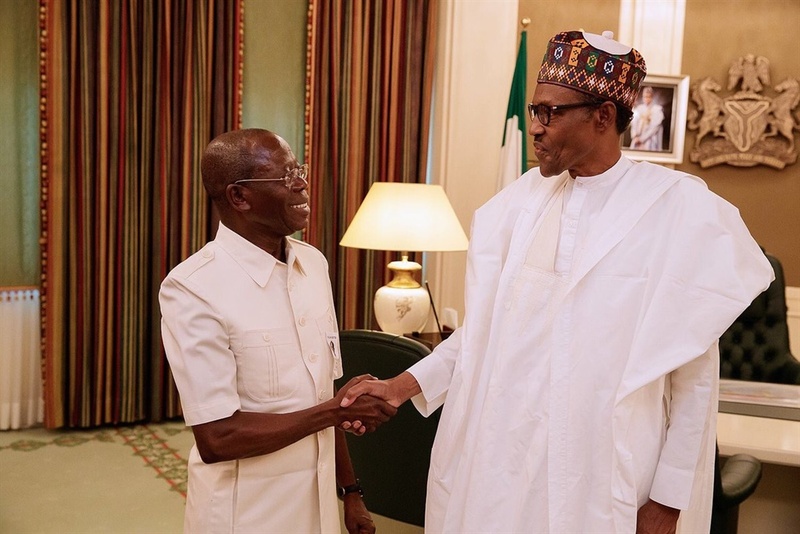 An APC source said, “Tinubu and Oshiomhole met in Paris on Thursday over attempts by governors and some members of the NWC to remove the party chairman. You will recall that it was Asiwaju who paved the way for the emergence of Oshiomhole as the chairman when Oyegun wanted a tenure extension. “Now that he has come under probe by the DSS and is being asked to step aside, he has run to Tinubu to save him. It remains unclear what their strategy will be to put a stop to the probe. Apart from Buhari, those expected at the Abuja meeting include: Vice President Yemi Osinbajo, Tinubu, pioneer Interim National Chairman of the party, Bisi Akande, the Minister of Science and Technology, Dr. Ogbonnaya Onu (as former chairman of the defunct All Nigeria Peoples Party), and Prince Tony Momoh (former National Chairman of the Congress for Progressive Change).